IAQA 18th Annual Meeting & Indoor Environment and Energy Expo (IE3) The views and opinions herein are those of the volunteer authors and may not reflect the views and opinions of IAQA. The information is offered in good faith and believed to be reliable but it is provided without warranty, expressed or implied, as to the merchantability, fitness for a particular purpose or any other matter. NOT ALL REMEDIATION IS THE SAME Improving the Environment forSensitized Individuals Michael A. Pinto, CMP, CSP Wonder Makers Environmental There is a growing awareness that when certain individuals become ill from the contaminants in a water-damaged-building (WDB),their bodies develop sensitivity to those specific pollutants, as well as to other compounds.In such cases "normal" remediation or cleaning does not result in an environment that is helpful or acceptable to the client. With new studies showing that up to 25% of the population could be genetically susceptible to this type of exposure ailment, it is crucial for both restoration contractors and the impacted people to know how to approach such problems so that any remediation or ancillary cleaning has the best chance of success. Looking for Mold-Related Health Answers in all the Wrong Places People who have been sickened by mold or who have been assisting in the restoration and repair of water-damaged buildings have seen it over and over again. The musty odor or visible fungal growth often produced by water damage can cause greatly varying problems from person to person, despite similar occupancy patterns. Some individuals become debilitated, and somehow know that it is the structure that is causing their problems. In contrast, a much greater number of similarly exposed people experience minor symptoms or none at all! Such situations do not fit a typical risk assessment from a safety and health standpoint. Training in the arena of chemical exposures teaches that there is a dose/response relationship. We are conditioned to expect that a higher dose of an offending compound is more likely to impact a greater number of individuals with more severe symptoms. However, when contamination situations do not fit that familiar pattern some investigators (and in this case, most of the mold control industry) fail to consider other possibilities and lazily fall back on the psychosomatic excuse for the sick people: "It's all in their heads." 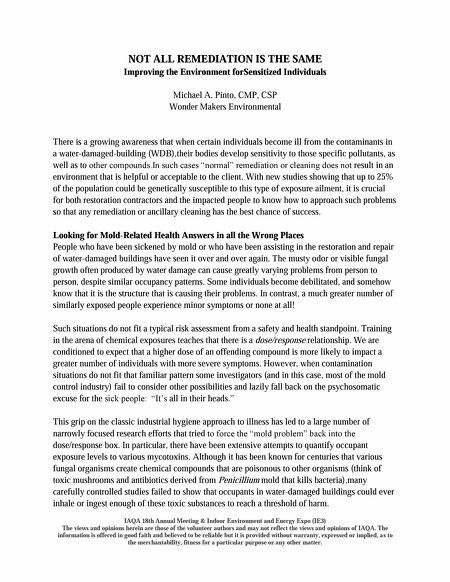 This grip on the classic industrial hygiene approach to illness has led to a large number of narrowly focused research efforts that tried to force the "mold problem" back into the dose/response box. In particular, there have been extensive attempts to quantify occupant exposure levels to various mycotoxins. Although it has been known for centuries that various fungal organisms create chemical compounds that are poisonous to other organisms (think of toxic mushrooms and antibiotics derived from Penicillium mold that kills bacteria),many carefully controlled studies failed to show that occupants in water-damaged buildings could ever inhale or ingest enough of these toxic substances to reach a threshold of harm.